Close to the city centre yet within a decidedly organic atmosphere. Our hotel is also suitable for company, business or social actions. For this purpose you can use the conference hall, suitable for 40 people, or hotel restaurant with the capacity of up to 100 people. In the hotel and his peaceful surrounding there you can comfortably solve your companys tasks and strengthen team spirit by sport activities for which it is possible to use adjacent woods, tennis courts and curling hall included. 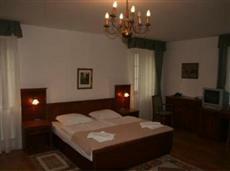 The hotel has a capacity of 19 rooms (2 single bed, 13 double bed, 2 triple bed, and 2 suites.